Upcoming class on 4/15/11 at 6:30pm we will be making this 2 page layout. There are a lot of elements to this page to make it unique. 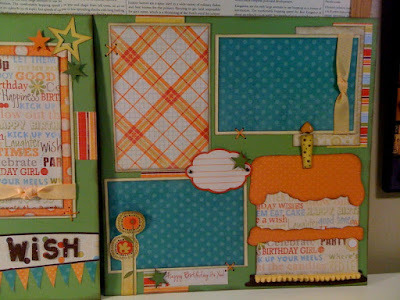 This is a great way to make a layout that is beautiful for a boy or a girl. There are alot of photo space. Not going to be available on the class date. Not a problem. Reserve your kit today and receive all the components to create this layout with detailed instructions and pictures. What to bring to class: Your Standard supplies plus fabri-tac and brown chalk ink.